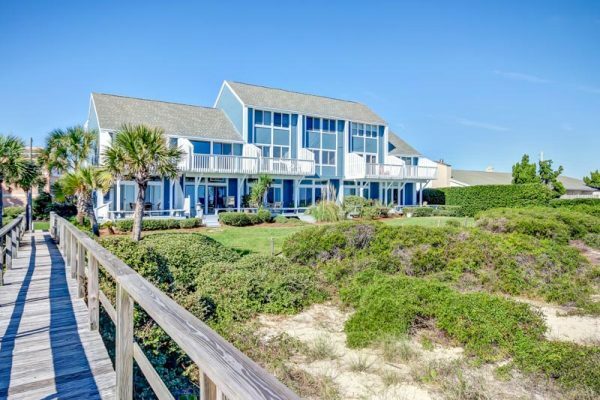 If you’re searching for a top tier vacation rental complex on Amelia Island with breathtaking ocean views and everything you need for a comfortable and relaxing short or long term stay, consider the townhouse rentals at Sandpiper Townhouse Villas. This impressive complex offers luxurious and spacious accommodations that are fully loaded with amenities and feature large open patios that face the Atlantic Ocean. When staying at the Sandpiper you will get a truly extraordinary Amelia Island vacationing experience that simply can’t be matched by lesser condominium or other lodging options, and you’ll love every minute that you stay there. Whether you plan on staying on the island for just a few days or for a longer trip, you’ll find that the amenities at the Sandpiper are perfectly suited for you. Choose from 2 or 3 bedroom condos with a small swimming pool nearby, covered carports, linen service, newly renovated full kitchens with granite countertops, a bar area, 2 to 3 spacious bathrooms, washer and dryer, WiFi internet access, dining table, flat screen televisions, hookups for gaming systems, and relaxing modern décor. These incredible features give you an authentic luxury lodging experience, and you’ll never settle for anything less again. Every day that you wake up at the Sandpiper is like a dream, with amazing views of the vast blue Atlantic right from the comfort of your patio. Make a quick breakfast and stare out at the breathtaking sunrise with a coffee as you wake up and get ready for the day. There are very few condos on Amelia Island that offer a similar unobstructed view of the Atlantic sunrise, and you’ll benefit from the fact that rentals at the Sandpiper are very competitive in their pricing compared to other lodging options with water views. When you stay at the Sandpiper you can easily take a walk to the beach anytime you want on the convenient wooden walkway. During the summer months, lifeguard service is available on the beach, which is perfect for families with children. Enjoy the luxury of being able to spend time sunbathing, swimming, making sandcastles, or going for a quick walk, jog or yoga session on the beach and then heading back to your luxurious condo anytime that you wish. You’ll also never have to worry about dealing with beach parking hassles which is a major bonus. The Sandpiper condominium complex is located on Sandpiper Loop right off Fletcher Avenue near Peters Point Beachfront Park. Peters Point is one of the top beach parks on Amelia Island and you’ll easily be able to walk there with your guests and family for a picnic or BBQ, swimming, or shell hunting. You can also easily make the short trip to downtown Fernandina Beach for all of the exciting events and attractions there, or head down further south to enjoy the American Beach area and Amelia Island State Park. We promise that your stay in these rentals will be one of the most pleasant vacation experiences that you’ve ever had, so reserve a unit online today or give us a call at (800)-741-4011.